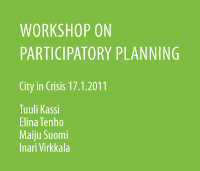 We got some of the elements done already last spring so some of the photos are older. Last week we continued with the remaining ones which should be ready by the end of this week so maybe we will be able to start installing the elements during the weekend! 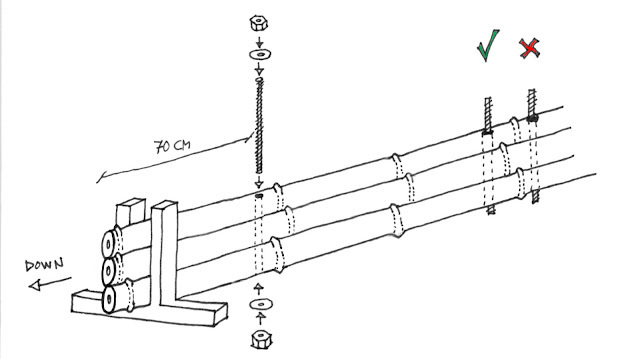 Making a beam and making a column is basically the same but there are some differences. The same tools are needed for both: a power drill with a drill bit long enough (most probably not available in the market so needs to be welded), an angle grinder with cut off wheels and ratchet straps and metal racks for holding the bamboo poles together. 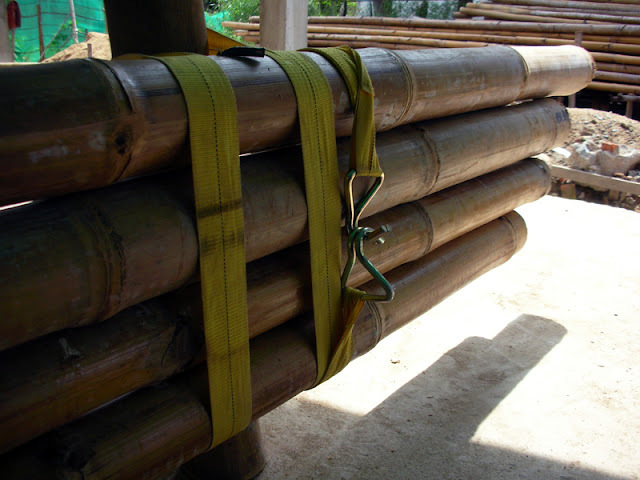 First the bamboo poles needed for the element in question are put into the rack in the right order. This is where the first difference between beams and columns come. 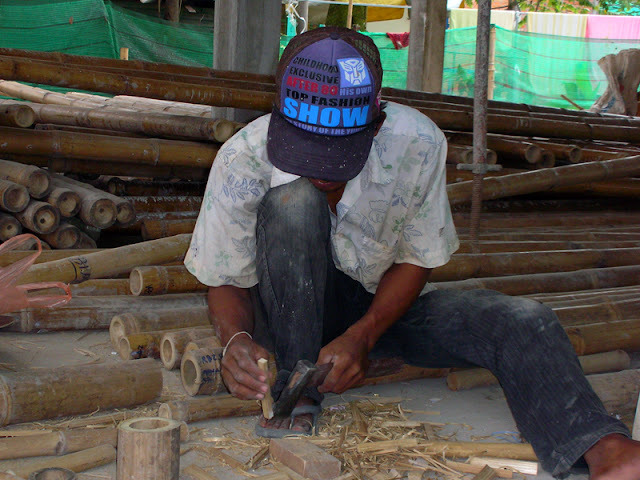 When making a column all the pieces should be facing the same direction: the bamboos grew in the forest the thick end downwards so they want to stay the same way in the building whereas a beam should be evenly thick in both ends so every other piece should face the opposite direction to even out the differences. 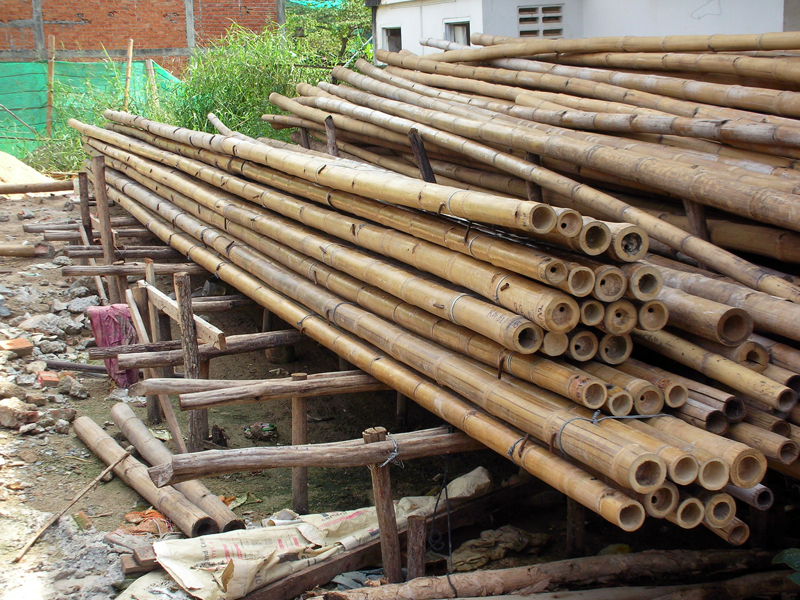 It is wise to design the beams for an even number of bamboo poles for the same reason. Another thing to check when placing the poles on top of one another in the racks is the curvature. The poles should never curve out of the plane of the element. When the poles curve in the plane of the element you can still drill through them and force them a bit straighter with the ratchet straps but if they curve out of the plane there is nothing to be done. Check the orientation, the curvature and that the ends are aligned and you're ready to strap the poles together and start drilling. In a column all the holes should be perpendicular to the pole and they should be right below nodes to direct the pressure to the nodes. 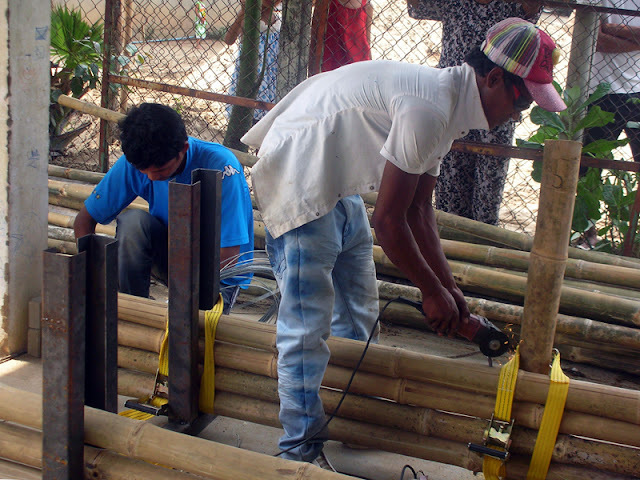 For making columns we used threaded steel rods with bolts and washers. 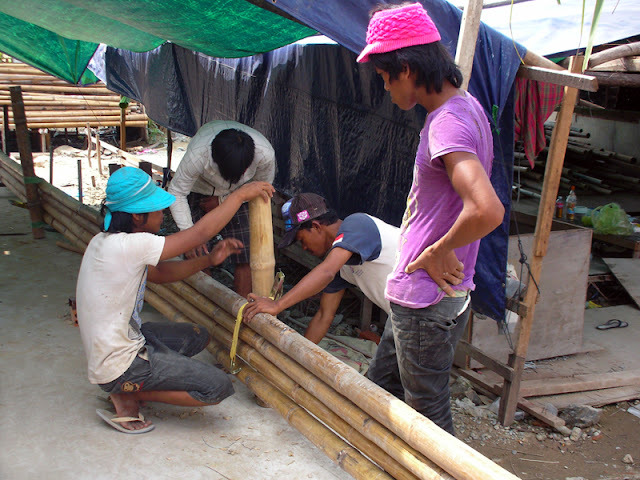 Drill the hole, put the threaded rod in, secure with bolts and washers, cut the ends of the rod and your column is done. In the beams the hole in the center of the element should be straight and the rest should be diagonal. 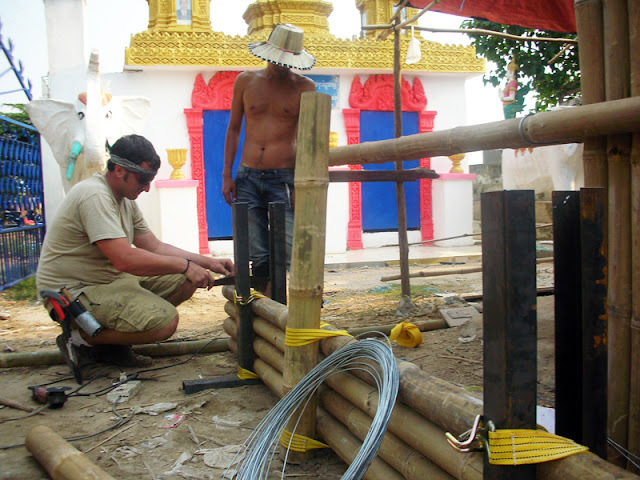 For making the beams we used smooth steel rods and steel wire. 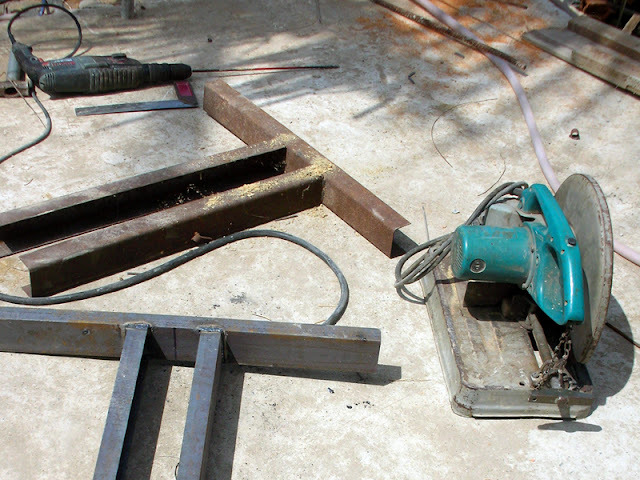 Pass the steel rod through the hole, leave the ends long enough, hammer them down along the beam and cut. Secure the connection by wrapping a steel wire twice around the element, tighten and rotate the ends of the wire around themselves. For extra tightness pass a piece of wire between the pole and around the main wire and rotate the ends to secure. Sometimes beams longer than the poles at hand are needed as was the case with our roof beams of 12m. 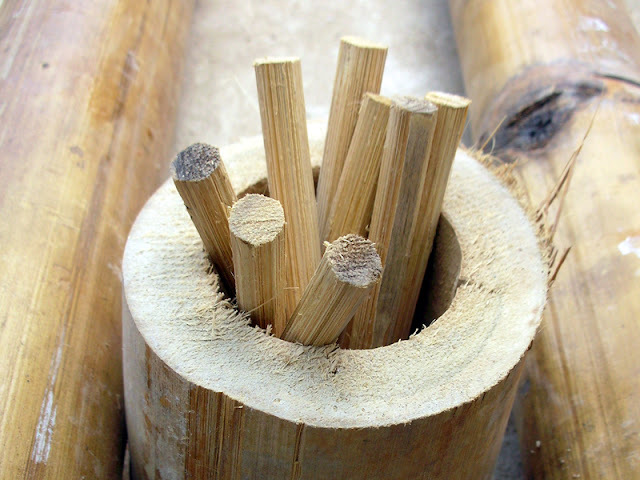 In these cases shorter bamboo pieces must be jointed to form a longer piece. 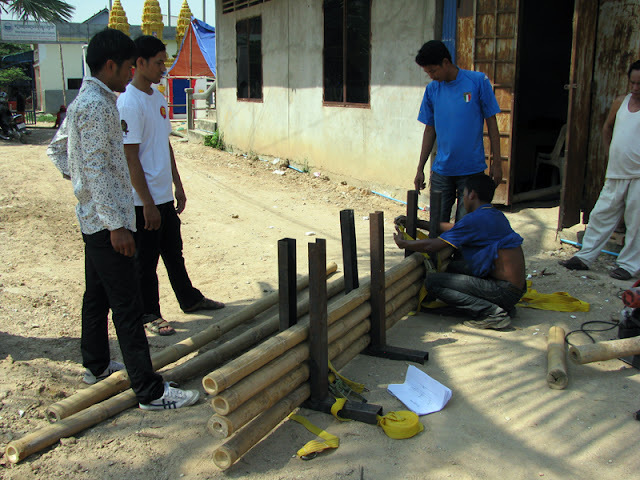 The locations of the joints must be designed carefully. 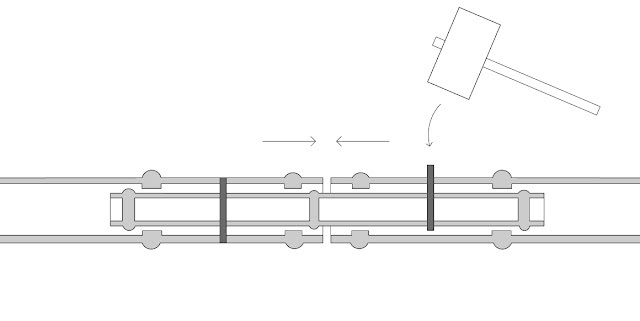 Because the joint is the weakest point of the beam it should always lie on a support. 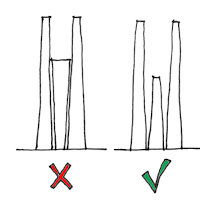 Also the joints should never be aligned in all the poles of the beam. The way to make a joint is fairly simple. 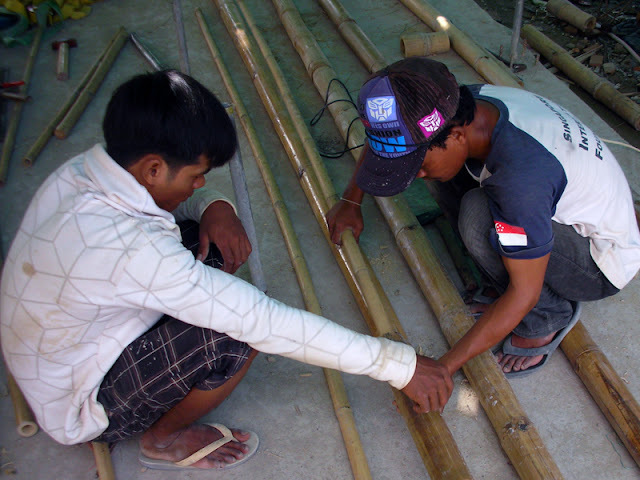 A piece of ping pong bamboo (or wood) long enough to reach two nodes in both combining poles is needed. Remember to use treated material for the joints as well and have nodes at the ends of the ping pong piece as well. The node walls should cleaned away from the first nodes of the poles with a chisel to fit the coupler inside. 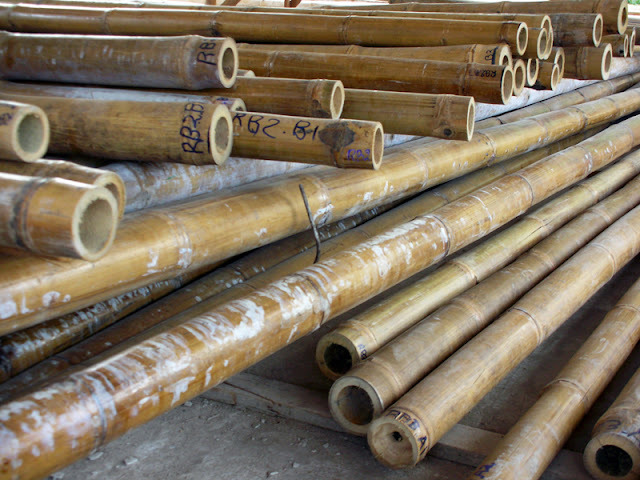 If you try to force it in the poles may crack and you have start the process sorting, measuring and cutting all over. 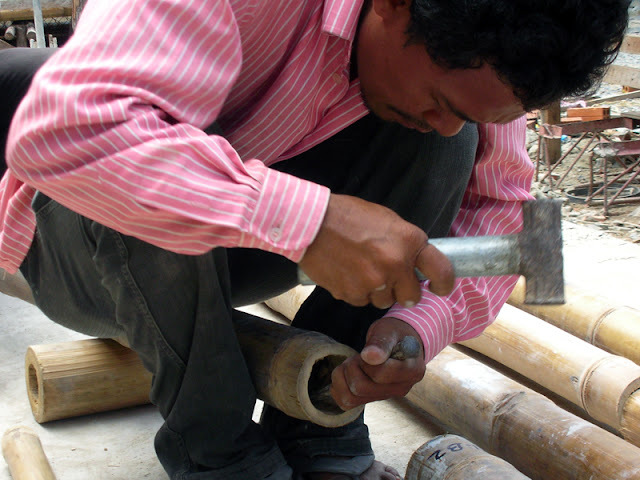 Once the coupler is inside a hole is drilled next to the first node of the poles and a bamboo peg is hammered in to keep the poles and the coupler in place. 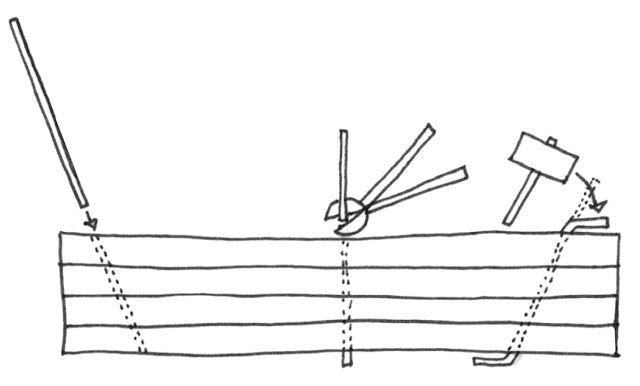 When making a beam with joints there should be steel rods placed diagonally on both sides of the joint. We have a whole bunch of roof beams ready but some still need to be made. Some more pieces will also be added especially to the columns during installation but more about that hopefully next week!